Rare map of New York City showing Masonic and Odd Fellows Lodges. 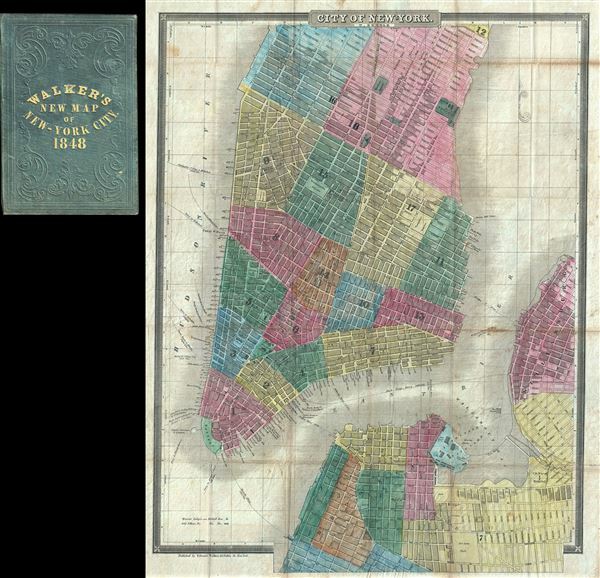 A scarce 1848 pocket map of the city of New York by William Kemble and Edward Walker. Based upon an earlier map by David H. Burr, this map covers New York City from 26th street on the west side and 40th street on the east side south as far as the Batter. Parts of adjacent Brooklyn, including Williamsburg, Brooklyn Heights, and Fort Green are also included. City wards are number and color coded, all streets are identified, and countless important buildings are noted. Ferry routes cross the East and Hudson Rivers in numerous places. The map is gridded in quarter-mile sections. The Burr map upon which this was issued in 1833. The present example, though generally similar, is slightly enlarged and includes numerous updates throughout - particular to the various buildings noted. For example the New York Athenaeum, originally located on Chambers and Broadway but closed in 1838, has been removed from this later edition. The map notes the original city of Columbia College near Park Place as well as the current site of New York University near Washington Square Park. Throughout countless churches, theaters, and public baths area also identified. Another major elaboration is the dramatic expansion of the Brooklyn portion of the map beyond the original map's border as far as DeKalb Street to account for the development of Fort Green Park and the surrounding streets. Also if interest is a revision to include both Masonic and Odd Fellows Lodges. A note in the lower left quadrant acts as a key to identifying these establishments. Walker was an Odd Fellow and man have been a Mason as well - hence this usual addition to the original Burr plate. This map is notably much rarer than the earlier edition by Burr, which enjoyed quite a long and substantial run. The OCLC identifies only 4 examples in institutional collections. Very good. Removed from original binder (included) and backed with archival tissue for stability. Stored flat. Minor wear and toning on original fold lines. OCLC: 18803986. New York Public Library, Map Division, Map Div. 01-1822. Haskell, D., Manhattan Maps A Co-operative List, 900 (1846).